There are many notable differences in physical and skill attributes between competition levels, especially in team sports.Stiffness is an important mechanical factor to measure when considering athletic performance and injury incidence. 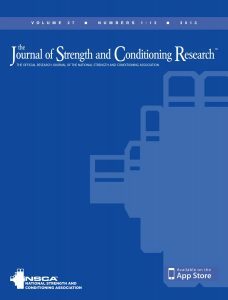 Active vertical stiffness (Kvert) during hopping and passive stiffness during lying and standing were measured during the preseason period for 46 female netballers (24.0 ± 3.7 years, 72.2 ± 7.6 kg, 175.2 ± 6.7 cm). Participants were classified as elite, sub-elite, representative or recreational based on their current level of competition. A 1-way analysis of variance revealed that elite players possessed significantly higher Kvert than recreational players (p = 0.018). Large effect sizes (ES) suggested that elite players also possessed higher Kvert than sub-elite (d = 1.11) and representative (d = 1.11) players. A number of large and moderate ES were also present when comparing the passive stiffness of elite players to their lower-ranked counterparts. The results of this study suggest that elite players possess higher levels of active stiffness when compared with their lower-ranked counterparts. The differences in stiffness levels may contribute to a player’s ability to physically perform at an elite level and also provide one explanation into elevated rates of injury at higher levels of competition. The results of this study suggest that stiffness differences between athletes of different playing levels are more evident during dynamic assessment than when tested under passive conditions. This becomes pertinent when considering the application of these results, as the conditions for assessing Kvert more closely represent movements performed in a netball game than the passive conditions used for myometry. Netball primarily involves dynamic movements such as running, jumping, and striding, and hopping is a simple bouncing gait (19) that closely represents the demands of high levels sports (32). Thus, the active stiffness levels measured during hopping, as opposed to passive stiffness measurements or asymmetry indexes, may be more indicative of the stress placed on the athlete that could potentially lead to injury, and the athlete’s ability to produce power in terms of performance variables. Therefore, if coaches and conditioning staff wish to monitor the stiffness of their athletes, they may wish only to assess stiffness during active motion, as this seems to be most relevant to training and game situations. Because this study has identified a relationship between higher playing level and greater stiffness, it is important that athletes, coaches conditioning staff are informed of the optimal level of stiffness to enhance performance while minimizing the risk of injury. Further research into the stiffness-injury relationship is required to define an optimal stiffness zone. The results from this study suggest that elite netballers possess significantly higher lower-body stiffness during active motion, and a tendency for higher lower-body stiffness under passive conditions. Because injury rates among netballers are greater in higher levels of competition, the difference in stiffness levels may provide one explanation into this occurrence. Stiffness testing is relatively simple to administer in a time-efficient manner and could be used as a tool to monitor injury risk and physical performance in netballers and other court-sport athletes.